4 bedrooms, 3 full baths, powder room, 1/2 bath-shower by pool, sleeps 6-8. Luxury home with every ammenity. You can rent all 4 bedrooms, 3 bedrooms or guest quarters. Home is on Tucsons premier Eastside private golf community of Ventana Canyon. Resort like living with Golf, Tennis, Fitness Center, Pool, Sauna, Steam Room, Massage, dining, etc. ---- all available upon request. World Renowned golf course offers challenges for every level of golfer. Lighted tennis courts are also available as well as an Olympic size swimming pool. Home is professionally decorated but comfortable and very livable. Great for entertaining with views from every window. Close to everything yet private enough to feel like you are in your own world. Golf course community is gated and entrance to property is gated as well. Pool and spa can be heated and TV's and wi-fi are available from most every room. This is more than a vacation home ---- it is a luxury vacation escape. Tucson boasts 330 days of sunshine per year with less than 10 inches of annual rainfall. Once here you will not want to leave. We make every effort to make your stay very special. We are available 24/7 should any problems occur. We have lived in Tucson for 40 years and find that this is the best community to call home. It is close to everything yet very private. You will want to call it home. Ventana Canyon Mountain Estates is a very special place within a gated Country Club community but on 14 acres giving you all the privacy you would ever need. You can rent this home with all four bedrooms, three bedrooms or just the guest quarters featuring one bedroom and small kitchenette. Regardless of how you rent it all the community amenities are available including workout room, spa, pool, tennis, and golf. Ventana Country Club is within walking distance to this home offering Sauna, Jacuzzi, Steam room, excellent dining and work out facilities. Ventana is a premier gated community in Tucson. Home is situated in the mountains with mountain and canyon views to the north and city and distant mountain views to the south. On a clear day you can see into Mexico. This home has forced air gas as well as three fireplaces. This home has three fireplaces. Full wireless internet is available from every room of this home. The club offers a sauna and steam room as well as jacuzzi, massages, facials, exercise classes, dining, full bar, and more. Two community pools are available - an Olympic size lap pool and a recreational pool. Both pools are heated year around. Ventana Country Club is within walking distance of propety and offers all spa and vacation ammenities. Property has private pool and jacuzzi and entertaining area. Over the course of 3 days, not a moment usurped the perfection of this home. We will return... And have not a doubt the magic will be any less. Amenities were great, as explained. Pool, hot tub and grill worked perfectly. Well kept and very clean. Beautiful subdivision, where we went for walks admiring the views and other wonderful the properties. We enjoyed many tennis games at the communal courts. We DEFINITELY recommend. Owners were extremely accommodating and kind. I'll start of by saying my wife, and 2 small children(7 and 16 months)stayed here for a few nites.Let me first say this house and the views that is has, the pictures do not do it justice.The house itself is meticuously maintained. I am very picky, and this place lived up to my expectations.The layout is excellent, and the living room and master bedroom are very spacious.The view from the bedroom, and the walkout patio is awesome.The kitchen was great.Plenty of room, while not huge, it was laid out nicely and the small eating area is fine if you're a family of 4 or less.If not, you can eat outside on the granite counter tops that make up the BBQ/Bar area.You could seat 6 along the bar, and another 6-10 on the tables that surround the bar on the patio.Plenty of seating if needed.As for the grilling area, it's perfect and has a minifridge, and another door that has all the grilling utensils you will ever need.Plenty of space, a sink, and nice Weber Summit grill that we used all weekend.The best part is the view from said BBQ, again is awesome.The sunset, we could not see due to it being behind a mountain unfortunately, but it was still awesome watching the lights on Tucson slowly flicker on as it went down. Master bedroom and bath are huge. 2nd bedbroom, my daughter used. Decent sized, what'd you'd expect from a 2nd bedroom with a full bath and TV.3rd bedroom we did not use but it's on the ground level. Kind of looks like an efficiency apartment with a small fireplace, fridge, and TV and full bathroom.Great if you are going with another couple/relatives.Plus it's private.Pool is small, but it was clean and cool.Hot tub was a nice addition, as is the outdoor shower for when you get out of the pool.Finally, there is a country club down the road.You are entitled to use it and the wife did get a massage there for about 60 bucks which is pretty reasonable.Also, we loaded up all of our BBQ utensils, seasonings, and other condiments.This place had that all included.Very nice touch, so if you do forget something, they probably have it.If not, you're about a 7 minute drive to a CVS I believe, and restaurants and neighborhood bars. If there is any cons, its the steps in the house and not being able to use the garage. My wife took a small spill, and my son did as well being he is so young.You need to be careful especially at nite.As for the garage,no biggie but it'd be nice.Finally, the owner Charlie was awesome and great to work with.We'll be returning again!!Thx! Very well designed and well appointed home, an architectural gem. 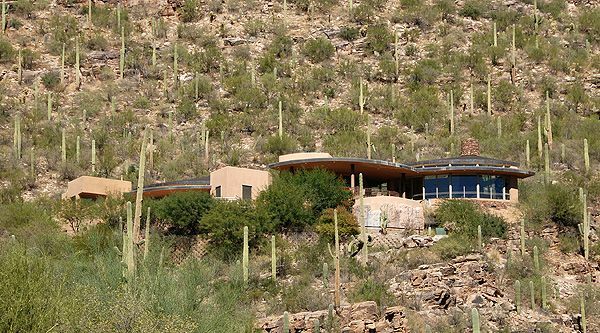 This unique home has some of the most spectacular views of Tucson from any perspective. We spent each evening watching the sun go down and the city lights come on. The heated pool and hot tub were great distractions for the rest of my family while I got to enjoy the spectacular golf on the private course. The owners were very accommodating and gracious. This home is very well appointed with beautiful furnishings so it is probably not ideal for young kids or a partying crowd, but if you like a relaxed luxury experience, I highly recommend this home. and the 3rd bedroom is an ideal "mother-in-law suite" with its own entrance/kitchenette etc. issues. But for the rest of us I cannot imagine a finer rental property in the Tucson area. Luxury Vacation Home on 14 acres nestled in the Mountains of Tucson overlooking the city and golf course below. Close to everything yet very private. You can rent the 4 bedrooms, 3 bedrooms or just the guest quarters. Gated Golf Course community and private gated entrance. Club House dining, workout room, tennis, golf, Jacuzzi, and Olympic size heated pool as well as a recreational pool for the children. Home has private pool and jacuzzi that may be heated upon request. Home has Master Suite with Jacuzzi Tub and walk-in shower with dual shower heads. Second bedroom has queen size bed and private bath with walk-in shower. Third bedroom has a queen size Murphy bed, living room quarters, private bath, and full Kitchen. Media room can serve as bedroom or Media room. Views from every room. Beautiful upgrades throughout. Hardwood flooring and granite counter tops. This is the premier vacation community in Tucson with a custom built home and designer finishes. Tucson is home to jazz, music, dancing, swimming, hiking trails, biking, horseback riding, southwest art and fabulous sunsets. Golf: Tucson has many golf courses. If you are an avid golfer, we may be able to get you tee-times at some of the private courses. Holiday Surcharge is per night over a holiday. We may require a longer stay on a holiday booking.